From the Texas plains to the Oregon wilderness, up Missouri’s Big Muddy to Montana Territory, and from the California mountains to Colorado’s cattle country... 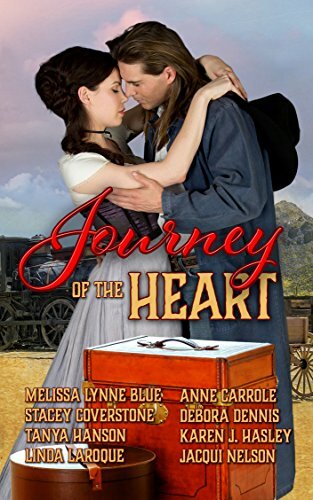 JOURNEY OF THE HEART is a collection of eight sigh-worthy romances, all revolving around modes of transportation in the Old West. Can a buggy ride change their past or create their future? Most families passed down noses, chin clefts, and even oddly shaped pinkie toes…but Susanna Martin hit the look-alike jackpot. She’d often wondered if her parents thought it amusing to give her the name of a woman who, in 1870, went on a bank robbing spree using her cleavage and bare ankles as a distraction. In their defense, how could they have possibly known she’d also end up the spitting image of her notorious namesake? Now, over a hundred years and thousands of miles from Prosperity Creek, California, the tale of her ancestor, Susanna Martin, aka Seductive Sue, lingered over the family like an uninvited house guest, wearing out her welcome every time, yet always showing up for the next holiday dinner. Over time, the embellished truths and lies intertwined and the legend was born, the family creating their own fifteen minutes of fame. The official fate of Seductive Sue had been shrouded in mystery after her last heist at the Prosperity National Bank had gone awry. The local paper declared her dead in a hail of bullets, but the lack of a body left her death as more speculation than fact. Though she was never seen or heard from again, there were reports of her changing her disreputable ways for a man. And not just any man, but one of Prosperity Creek’s most notorious gamblers, Jonah Pinkerton. Susanna had spent the most of her twenty-five years soaking up family folklore, and too many of hours of internet searches in the last few years to count. It was finally time for a vacation, where she might be able to find answers to questions regarding her ancestor. Between her own anemic love life and landing a freelance writing assignment on the life of female bandits in the Old West, this trip west couldn’t have been more perfectly designed. If nothing else, the story of Seductive Sue would make an intriguing footnote. Would she find anything new to add to the legend by visiting the town? She doubted it. Could she resist the challenge? Absolutely not. The day before the 145th anniversary of that fateful day, she finally arrived to see Prosperity Creek for herself. After weeks of planning, switching planes twice between New York and San Francisco, driving four hours and getting lost two times, Susanna pulled into a gravel lot outside of town, turned off the ignition of her rental car, and surveyed the town in the distance. No cars allowed; Prosperity Creek was a place that embraced its past and welcomed guests to become a part of their world as it used to be. A step back in time, with only a few modern conveniences, the Grand Hotel boasted air conditioning, modern showers and wifi. The only modernized hotel in town was the place she’d made reservations at. She grabbed her suitcase from the backseat of the SUV and dropped it to the ground with a thud into the dry desert dirt. She dragged it toward the edge of the parking lot, the wheels kicking up dust even as clumps of the red-brown dirt prevented them from spinning evenly. Only one other car occupied a space between her car and the designated pick-up area, and it was covered in a sandy film. Pulling a chilled water bottle from her bag, she held it to her cheek, took a quick drink and waited for the shuttle to town. A horse and buggy rounded the bend, the driver holding the reins loosely as the horse walked at a leisurely pace in her direction. “Susanna Martin?” The driver tipped his hat as the buggy came to stop in front of her. Her foot securely on the step, Susanna grabbed the side of the buggy and hoisted herself up. He hopped back onto the bench seat next to her, and with a soft snap of the reins, they jolted forward and were moving. He turned the horse around, the peaceful town now directly in front of them. “So, you here on vacation or you plan on robbing the bank?” He laughed at his joke and she rolled her eyes. “Excuse me?” Susanna tucked her hair behind her ears, not sure she’d heard correctly. “She a relative of yours?” he asked. Oh, yeah, he was a bright one. He stared at her feet with his gray eyebrows arched as his gaze traveled from her low-ankle boots to her face in one slow movement. He smiled, then leaned over and spit into the dirt. "Either one works." 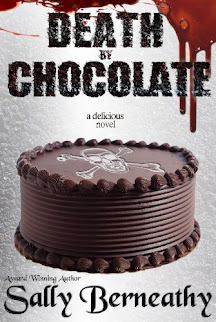 She shifted on the dusty bench as it bumped along the road and cringed as he spit more chewing tobacco, his black smile repulsive. Turning her head, she took in the sparse landscape; trees and shrubs dotted the area and wildflowers of blue and yellow scattered the countryside. The hot sun beat down, the water bottle in her hand warming quickly. It was August, a hundred miles from normal in the foothills of California’s Sierra Nevada mountain range. Oh Susanna, what were you thinking?